One thing I love about my job is I never know exactly what to expect. I teach six very different groups of third through fifth graders each day and they always surprise me with their ideas. I never would have guessed the biggest surprise of my career would be a phone call from the office last Tuesday. "Jim, would you be willing to sub in kindergarten today? I know some of your reading switch classes are canceled due to today's benchmark assessments, and we can't find anyone to take Mrs. C's class." I've always liked kindergarteners...from a distance. Throughout my teacher training and time substitute teaching I taught all subjects and worked with tons of high school, middle school, and elementary students, but never kindergarteners. I honestly have a terrible fear of stepping on them. I'm 6'3" and the average kindergartener is somewhere around three and a half feet, so it's within the realm of possibility that I could accidentally crush one under my size 12 Doc Martens. But I'm part of a team. And it was my son's class. I didn't want him and his classmates to be without a teacher for the day, so I said yes. I'm glad I did. It's all about community. Every activity in that kindergarten class started with carpet time. Students sat close together and listened to me explain what we were going to do. They were in a safe place to ask questions and clarify their understanding before they tried something new in the classroom. 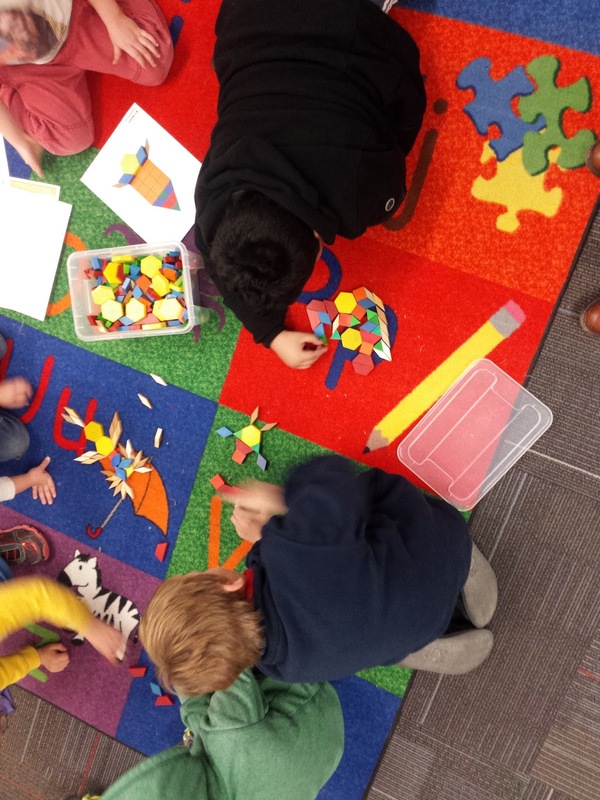 When they had free choice at the end of the day, the kindergartners naturally worked together on activities like puzzles and games. School should be joyful. I equate music with joy, and kindergarten is a musical place. I didn't get to sing the color songs or the Handwriting Without Tears songs in my day as a kindergarten teacher, but we did get to do "Head and Shoulders, Knees and Toes" and I even made up my own "Let's All Come To The Carpet" song to the tune of the old movie intermission song. Routines give the day a rhythm. This is the first year our school has had all-day kindergarten. It's a long day for those guys. I know my little guy frequently falls asleep on our way home from school. 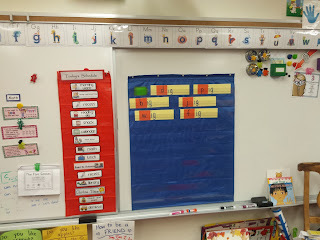 Mrs. C has built a great schedule for her students. They do their reading and math in the morning with breaks for a snack, recess, and wiggle time. After lunch they have some quiet time before afternoon recess and specials. Then they have free choice time before gathering together to wrap up the day. Everything got done without feeling rushed. Learning through play is best. When it's time for independent work in kindergarten, a lot of it is done through play. Students cut out rhyming words and scooted them around trying to match them to pictures. During free-choice time at the end of the day, kids picked all sorts of games, puzzles, and other activities to work on and they learned while doing it. I frequently hear upper grade teachers say there's no time for play with all of the pressures of testing and standards. Heck, I know I've said it. Kindergarten teachers are under a lot of pressure, too. They're expected to get kids reading and ready for the demands of first grade, but they still recognize that play is often the best way to learn something. Kindergarten teachers are magical beings. I had a great time teaching kindergarten for one day, but I was exhausted at the end of it. I was so impressed by the culture of Mrs. C's class and the way the kids, classroom assistants, and volunteers got things done in there. I've always had a lot of respect for kindergarten teachers, but after walking in one's moccasins for a day, I am absolutely amazed by what it takes to be a good kindergarten teacher. I am overjoyed that my son is in such a great class. I haven't started using pocket charts with the big kids. I've taken those lessons back to my classes. This week, my students have done more learning through play. In fact, I used games to collect data for some math assessments. I've been using more music in my classroom. I haven't called my kids to the carpet with a song, but we've been listening to appropriate background music - "Switched on Mozart" with a robot challenge and college fight songs with sports problem-solving. I'm still working to improve the community and rhythm in my classes, but I need to keep experimenting to make that work for my 45 minute classes. 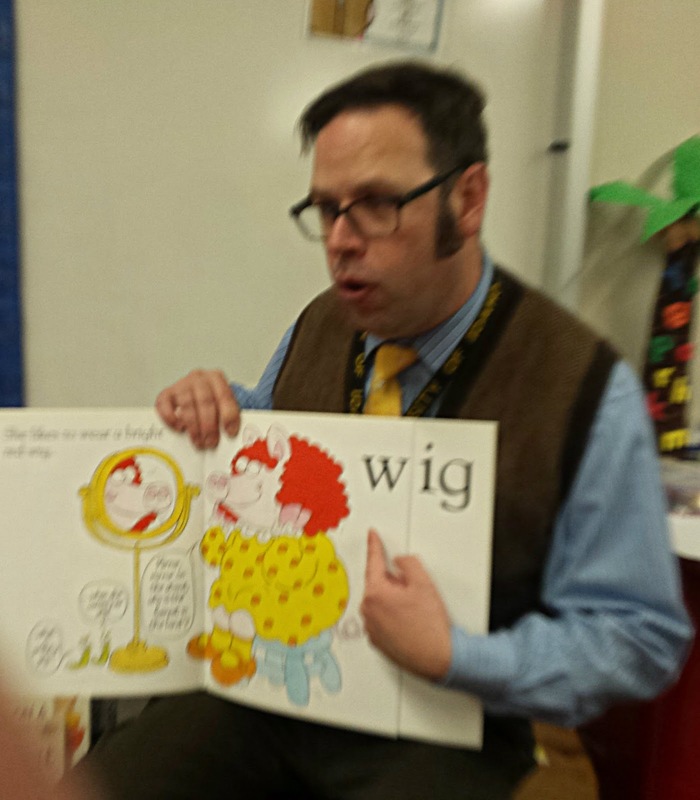 Teaching kindergarten for a day was completely worthwhile. I knew a lot of my son's classmates before, but now every kid in that class greets me in the hallway or out at recess. I feel deeply connected to a part of the school that seemed quite distant in the past. The best part, though, was my son's comment at the end of the day. He said, "I'm sad Mrs. C was sick, but I'm kind of happy about it because you got to be my teacher." I am so glad to be on your team and thank you for covering for me! You inspire me to be a better teacher, so I am glad your day in kinder gave you some positive take aways. You are welcome in our kinder room anytime!! :) Kim..."Mrs. C."
Hate is poison. Education is the antidote. This is my personal blog. All views presented here are entirely my own and do not represent the opinion of my employer. The Teacher with a Tuba blog is licensed under a Creative Commons Attribution-NonCommercial-ShareAlike 4.0 International License.